Who will take IS fighter and his teen bride? In an interview with the BBC's Middle East correspondent, Quentin Sommerville, Mr Riedijk said he rejected IS and had tried to leave the group. Describing life under IS control, Mr Riedijk also said he attended the stoning of a woman for "fornication", saw piles of dead bodies in the city and lost an infant daughter to malnutrition. He sits opposite me in a yellow plastic chair, 27 years old now, in a freezing interview room in a Kurdish detention centre. His guards have just removed his handcuffs. If I see Shamima, he asks me to "tell her that I love her and have patience". "Hopefully soon we'll be together again and things will turn out alright, hopefully." It seems unlikely that will happen anytime soon. Over the next hour, he paints a contradictory picture of an insulated home life, and a maelstrom of terror outside. Read more from Quentin here. Ms Begum, now aged 19, escaped with her IS fighter husband from the town of Baghuz, the group's last territory in eastern Syria, as the caliphate crumbled. Mr Riedijk surrendered to a group of Syrian fighters, and Ms Begum and their newborn son, Jarrah, ended up among 39,000 people in the al-Hol refugee camp in northern Syria. Mr Riedijk also told the BBC he saw nothing wrong with marrying Ms Begum - 15 at the time, while he was 23 - because it was "her choice". Describing how he met the schoolgirl from east London in the women's centre in Raqqa, he said he was initially not interested because she was too young. He said: "To be honest, when my friend came and said there was a girl who was interested in marriage, I wasn't that interested because of her age, but I accepted the offer anyway." He added that she had seemed to be "in a good state of mind". Mr Riedijk, from Arnhem in the Netherlands, insisted: "It was her own choice. She asked to look for a partner for her, and I was invited." He conceded "she was very young, maybe it would have been better for her to wait a bit", before adding: "But she didn't, she chose to get married and I chose to marry her." The UK has revoked Ms Begum's citizenship on the grounds that she is a Bangladeshi national through her mother, who is a Bangladeshi citizen. But Bangladesh's ministry of foreign affairs has disputed this, saying Ms Begum is not a Bangladeshi citizen and that she will not be allowed into the country. And, last month, Ms Begum's family told the home secretary they were going to challenge his decision to revoke her UK citizenship. 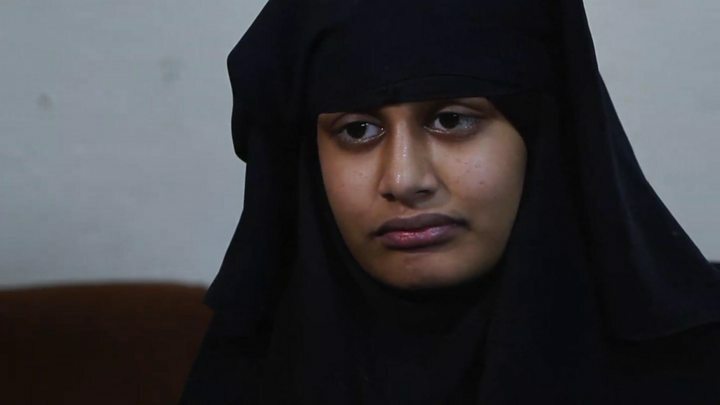 In the letter, seen by the BBC, Shamima Begum's sister Renu said they could not "simply abandon her" and asked for assistance in bringing her newborn baby to the UK. Labour leader Jeremy Corbyn, meanwhile, said Ms Begum had a "right to return to Britain" - and called the decision to revoke her citizenship "extreme". However, BBC foreign correspondent Anna Holligan said Ms Begum would struggle to get her underage marriage recognised in the Netherlands, and any application for a residence permit would be jeopardised by the fact that she too was suspected of terrorism crimes. Their newborn son though, might be entitled to Dutch citizenship through his father, she added. Recently, the Dutch justice department has warned of the threat posed by jihadist women returning from abroad. It said even women and children, who were not trained and did not take part in hostilities, could pose a "long-term potential threat" because of exposure to IS ideology. He was one of 300 Dutch men and women who travelled to Syria and Iraq, our correspondent said. Of those, some 135 Dutch nationals with "jihadist intentions" are still there, according to anti-terrorism officials. It is not known how many want to come back, but last week the Netherlands removed the citizenship of another Dutch jihadist, Outhmane B. The Dutch justice ministry has said those wishing to return will receive no government help. It added, however, that if Mr Riedijk turned himself in at a Dutch embassy or consulate he would be sent back to the Netherlands to serve his six-year prison term.